The Oregon coast sees millions of visitors, and beaches can be filled with people enjoying the gorgeous views and rugged coastline. From Astoria down to Brookings, summer can be a busy time of year on the Oregon coast. To escape the crowds and see the area at a slower pace, we've put together a list of the five places to paddle and kayak on the coast. From lakes to rivers, natural areas and sea caves, there's something here for every ability level, including families. Coffenbury Lake put-in area. Photo by Denis LeBlanc. Nestled at Fort Stevens State Park, Coffenbury Lake is roughly a mile long and rather narrow. With planting done to reduce erosion, the lake is a forested retreat amongst the dunes. This extra vegetation attracts wildlife like deer, elk, and and osprey. For campers at the Fort Stevens Campground, paved trails make it easy to haul boats to the water. Docks at the northern end of the lake give easy access for boating as well as fishing. Picnic tables and restrooms are located at either end of the brief access road that stretches the length of the lake. This paddle is suitable for all abilities. 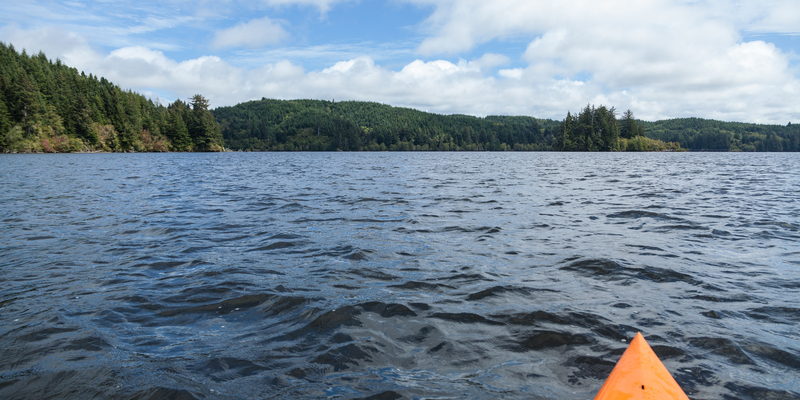 The paddle from Tahkenitch Landing Campground around Jewitt Island is a quick way to get a sense of the lake's size and scenery. Photo by Halvor Tweto. Tahkenitch Lake is located just off Highway 101. The large lake offers a potential reprieve from the strong coastal winds. 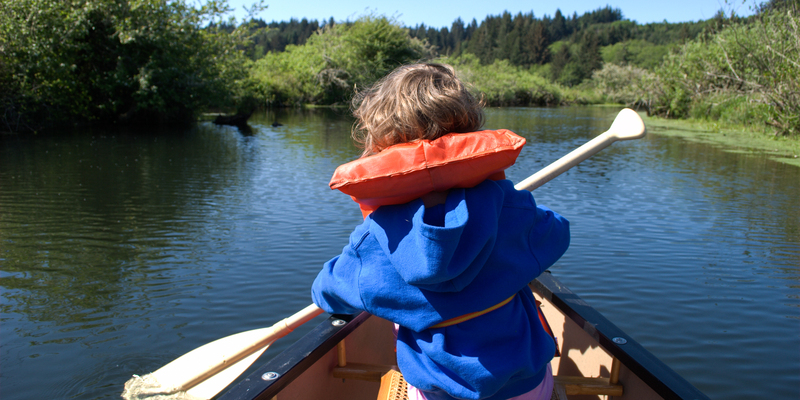 Kids and beginning paddlers can find relief from the gusts as they explore the waterway. With excellent fishing available, ranging from perch to coho salmon and lake trout, consider tossing a fishing rod into your boat before you head out. Two boat ramps are located on the northwest edge of the lake, just off of Highway 101. From here, the islands of Jewitt and Weed make great destinations for beginning paddlers. This adventure is suitable for all ability levels. 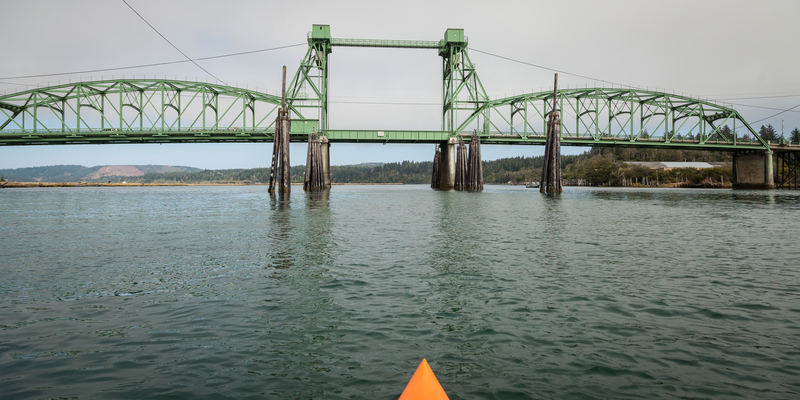 Paddling upstream under the Coquille River Bridge. Photo by Halvor Tweto. The boat ramp in Bullards Beach State Park makes for a great put-in for paddlers because it offers multiple itinerary options depending on the flow of the river and state of the tides. The ramp is 2.75 miles from the river’s mouth, so in a low or outgoing tide the Port of Bandon, located in Bandon’s downtown, makes a great destination. When the tide is moving in, turn upstream from Bullards Beach State Park. From here it's nearly the same distance, approximately 2.6 miles, to the boat ramp at Rocky Point. Once under the Bullard Bridge, the Ni-les'tun Unit of the Bandon Marsh National Wildlife Refuge opens up on the river right bank (on your left as you paddle upstream). Paddling in tidal rivers requires an extra bit of understanding. Attention to the seasonal flow levels, the timing and size of the tidal influence will all help you in planning an enjoyable trip. This trip is suitable for all abilities. Easy family-friendly water in Beaver Creek Natural Area. Photo by Vanessa Davids. Beaver Creek State Natural Area is part of Brian Booth State Park. The natural area serves as an important part of the Beaver Creek watershed, connecting old-growth forests, coastal areas, and marsh habitats. Wide, flat bends make this a perfect paddle for beginners. Heron, osprey, river otter, and beaver sightings are numerous here, and smaller side channels show the tracks of birds and small animals. Due to the slow current, this creek can be paddled in either direction without need of a shuttle. 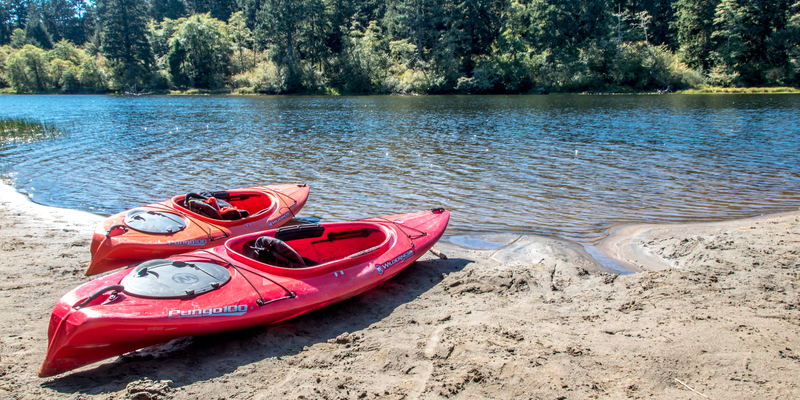 A brief downstream paddle from the Ona Beach boat ramp on the east side of Highway 101 leads to the Pacific Ocean, while heading upstream will lead to a wildlife-filled riparian habitat. Be forewarned that winds can pick up in the afternoon, making the return trip downstream a bit more challenging. This trip is suitable for all abilities.